"Deep garnet hue with a fascinating array of aromas from mineral and floral to earthy/animal and baking spice/wild thyme. The fruit shines through on the palate with bright cherry, blackberry and mulberry complimented by a rich earthy vein. The savoury characteristics from a cool and exceptionally low cropping vintage are sensational when married with the classic Gibbston silky, fine tannins and electric acidity. Perhaps our most intriguing Pinot to date from this vineyard with vine age playing an important role in capturing a special vintage. This punchy young wine gives immediate gratification but it has all the hallmarks of a wine that is very worthy of cellaring and will show even more exciting features for many years to come." "Rich garnet hue with aromas of rose petals, ripe cherry, mushroom, cardamom, and cedar on the nose. The palate has layers of bright red fruit (cherry, raspberry, and a hint of cranberry); dried herb (wild thyme, rosemary); and earthiness (mushroom, loam, cedar). Highly aromatic, richly concentrated and incredibly energetic - this Pinot Noir shows the amazing multi-faceted characters of Gibbston. Plenty of intrigue in its youth, this wine will continue to unravel and give tremendous enjoyment for many years." Named in the "Fine Wines of New Zealand List 2017"
"Bright garnet colour with rose petals, red cherry, doris plum and baking spice on the nose. A long and highly aromatic palate with layers of delicious red fruit, rosemary, wild thyme and an earthiness that compliments the enchanting florals. 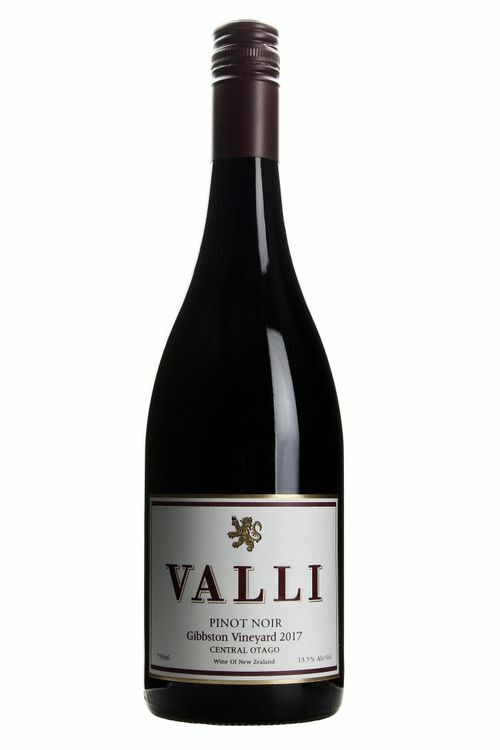 This is a worldly Pinot Noir with great length, fine tannins, vibrant acidity and noble power. Its unique character sings harmoniously of its Gibbston origins, a tiny place that produces exceptional wine that is enjoyed young and will also continue to develop for many years to come." 95/100 - Jamie Goode, Wine Anorak: "Fine, expressive nose with spicy highlights alongside fresh raspberries and cherries. Very pure with lovely plum fruit. Bright, expressive and pure with nice weight." "A classic Pinot fragrance of violets and rose petals accentuated by bright red fruits and garrigue spices. Savoury undertones of earthy loam and cedar add to the intensity of the finish. Balanced and concentrated with fresh acidity that is framed by ripe and silky tannins, this wine offers great cellaring potential as well as youthful enjoyment." "Winemaker Grant Taylor describes this vintage as “taking Gibbston to a place it’s never been before”. Beautifully perfumed aromatics: floral in nature, and reminiscent of violets, ripe red berry and cherry fruit. Concentrated core of berry fruit flavours wrapped around bright acidity and very fine, ripe tannins. This vintage is Gibbston showing power, concentration, finesse and beauty all at the same time." "Winemaker Grant Taylor describes this 2009 as “quintessential Gibbston” and possibly his best Pinot Noir to date. Highly perfumed with layers of aromatics, sweet earth, and dried herb spiciness, hints of floral violet and red fruits. Concentrated with long silky texture and flavours wrapped around a bright acid core, balanced by very fine ripe tannins. Consistency through palate, length and perfect balance define this wine." 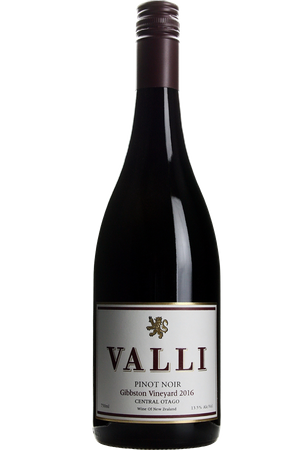 "Bright raspberry, cherry, cola fruit, exotic spices with hint of toasty barrel in background. Silky, supple texture wrapped around a core of bright acidity waving seamlessly through the palate. A broad range of flavours adding to the wine complexity and length. Very fine ripe tannins. Life expectation: 10 years at least." "Nose: Layered spice, cedar and violet aromatics. Palate: Long silky textured mouth feel supported by a structure of bright acidity. This is the core and backbone which is complimented by the red fruits, dried tarragon, thyme and seasoned spices. Gibbston’s length of flavour and longevity is due to this bright acidity whereas Bannockburn Pinots live more on their tannins."